Awhile back I saw a YouTube video about making homemade flour tortillas and I've been wanting to try ever since. Fortunately my nesting instincts late in this pregnancy have tended towards LOTS of cooking and baking so I gave it a shot yesterday. At first I was a bit irritated by the fact that I couldn't roll the dough into actual circles but then when we filled my fresh odd shaped tortillas with taco fillings (Smart Ground soy protein with taco seasoning, corn and cheese), I realized I could get over it - those were gooooodddd!! 1. Dump the dry ingredients into your mixer and combine them well. 2. Add the shortening and mix until the flour resembles cornmeal. 3. Add the water and knead with a dough hook until the dough is smooth and elastic. 4. Preheat a large skillet over medium-high heat. I didn't use any oil, I just used a nonstick pan which seemed to work out just fine. 5. Divide the dough into balls that are about 2 inches in diameter. On a well-floured surface, roll one ball out as thin as you can get it using a floured rolling pin. 6. Cook the dough until it starts to bubble a little. We prefer slightly under-cooked tortillas - not much brown at all because I knew we'd want to fold them around taco fillings. I found that if I cooked them too long, they actually got a little crispy. Flip the tortilla when you see some bubbles forming. 7. The timing works out pretty well that you can roll out the next tortilla while one is cooking. 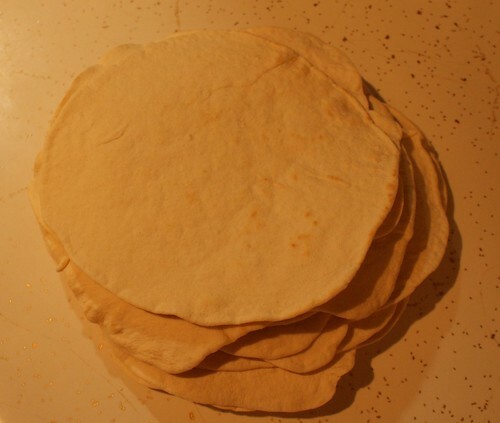 When a tortilla is finished, place it in a tortilla warmer or serve them up right away. We put our extras in a Ziploc bag in the fridge. Give it a try, they're SUPER tasty!! UPDATE: I just dropped one of these in a nonstick pan, coated it with pizza sauce, mozzarella cheese and Parmesan then topped it with another tortilla. I cooked it on medium-high until the tortillas were crispy and the insides gooey and it is SOOOOOO good!!! I'm calling them pizza quesadillas. Nom!